Verbatim DVD+R offer 4.7GB or 120 Minutes of write-once storage capacity, superior recording quality, and compatibility with 1X to 16X DVD+R writers. 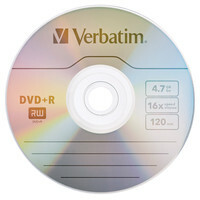 Verbatim's 16X cutting edge technology allows users to record a complete 4.7GB/120Min disc in approximately 5 minutes. Recognised as the choice for professional users, Verbatim DVD+R offers the optimal "Advanced Azo" recording dye, which provides the highest level of read/write performance, reliability, and archival life.